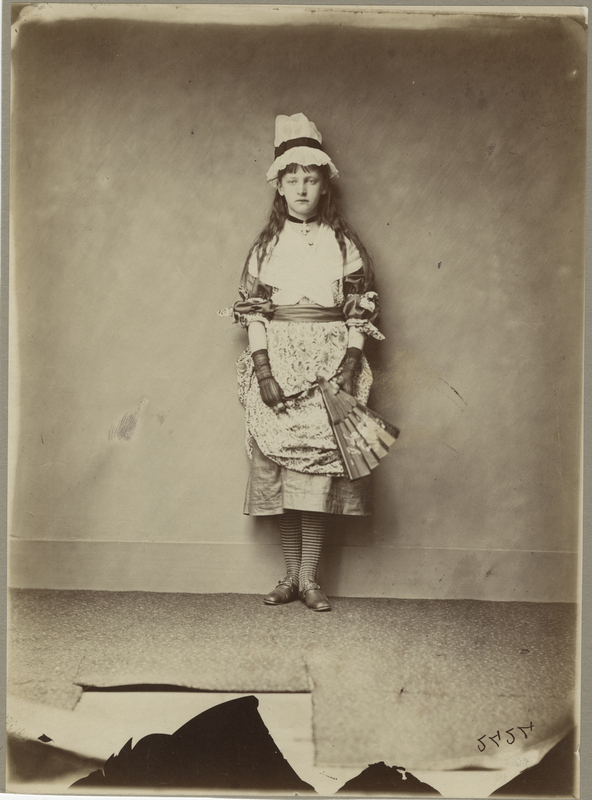 The Ransom Center recently launched a new platform of digital collections on its website, which includes the Lewis Carroll (Charles Lutwidge Dodgson) photography collection. More than 50 items from that collection, including the portraits highlighted in this blog post, can be viewed on the new platform. Posing for the Rev. Charles L. Dodgson (1832–1898) for over a dozen years, Alexandra “Xie” Kitchin (1864–1925) grows up before our eyes through the series of portraits made of her during the 1860s and 1870s. Named after Princess (later Queen) Alexandra, who was a close friend of her mother, Xie (pronounced “Ecksy”) was the daughter of a clerical colleague of Dodgson’s at Christ Church College in Oxford. She began sitting for Dodgson’s tableaux at the early age of four, and, by at least one historian’s count, sat for him more than 50 times before she turned 16. 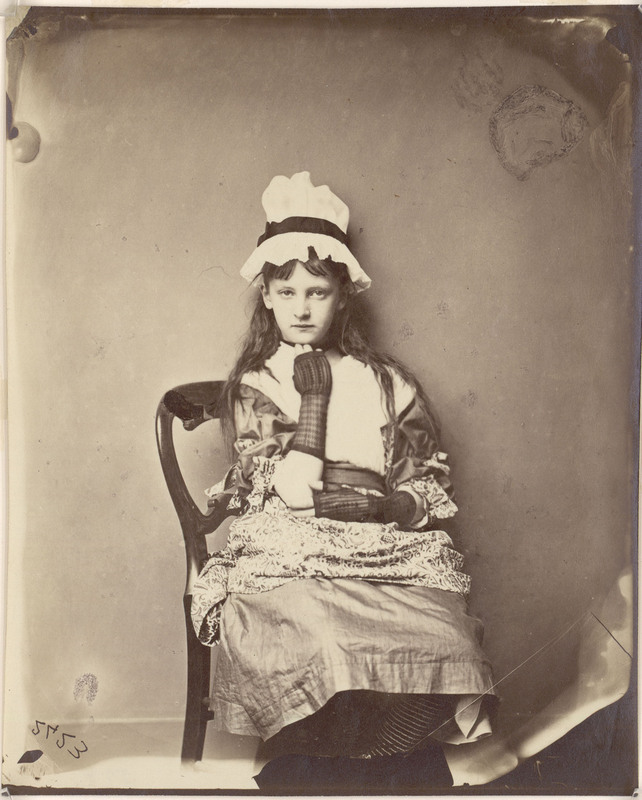 Several other children—or “child-friends”—that Dodgson photographed were quickly bored with dressing up and sitting for long poses before the camera, but Xie participated well into her teens and is frequently referenced in the photographer’s diaries. 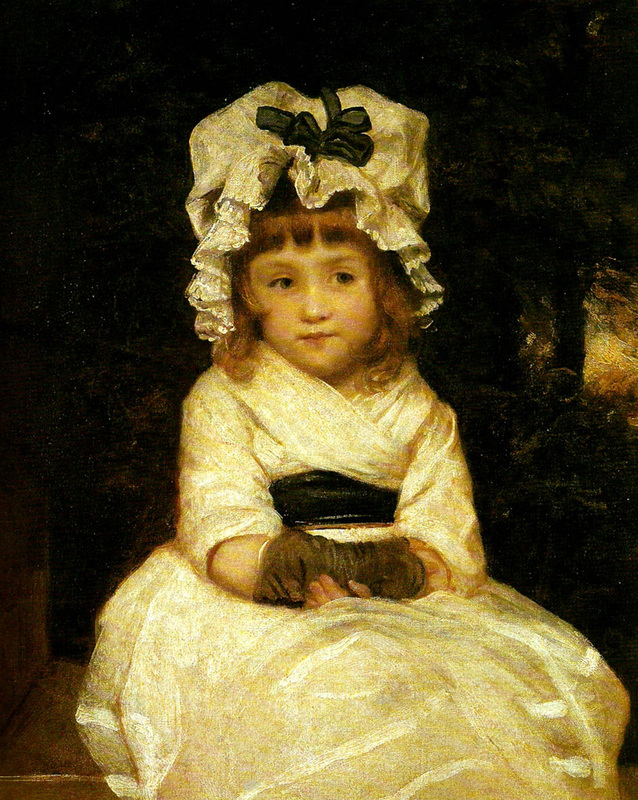 Dodgson’s first, or “seated,” portrait of the costumed Xie is directly influenced by one of the greatest child portraits of the Georgian Era, Sir Joshua Reynolds’s painting of Penelope Boothby (1785–1791). Penelope, the only child and heir of Sir Brooke Boothby, the seventh baronet, and his wife, Susanna, was painted at the age of three in Reynolds’s London studio in July 1788. By all accounts, Reynolds enjoyed the company of small children as much as Dodgson and had a fine relationship with the young Penelope throughout their sessions. Art historians attribute the endearing quality of the painting to their brief but strong personal bond. Another factor contributing to the painting’s fame was the tragic fate of its sitter. Young Penelope would spend the remainder of her short life at the family estate at Ashbourne Hall in Derbyshire. She died apparently of encephalitis in 1791, a month before her sixth birthday. Her death led to the tragic collapse of her parents’ marriage. 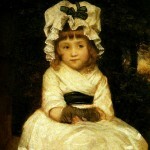 After the final breakup of the family estate, this most successful of Reynolds’s child portraits eventually found its way to the Ashmolean Museum in Oxford, where Dodgson undoubtedly fell under its spell a half century later. Dodgson posed a costumed but clearly older Xie in a position similar to the Reynolds painting. He also had her stand in costume for a second pose. 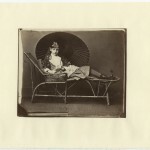 For the final image from the series, he brought into his studio a wicker chaise and an Oriental parasol, had Xie remove her oversized “Mob-Cap” bonnet, and placed her in semi-recline in the chaise. The resulting tableau, an original Dodgson composition combined with Xie’s own studied gaze, would become one of the great child portraits of the Victorian Era. 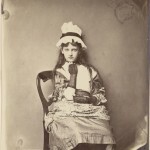 Dodgson, who gained early fame in mathematics and literature under the pen name of Lewis Carroll, remained an avid photographer for 25 years until abandoning the art in 1880. He retired from teaching the following year but stayed in Oxford, writing about mathematics until his death in 1898. Xie Kitchin published no memoirs or reminiscences of her friendship with Dodgson, but she would go on to marry and live in London until her death in 1925. Interestingly, the first of her six children was named Penelope. Rev. Charles L. Dodgson. 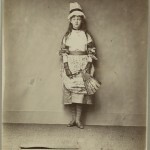 “Xie Kitchin as Penelope Boothby, standing.” 1875–1876. Rev. Charles L. Dodgson. 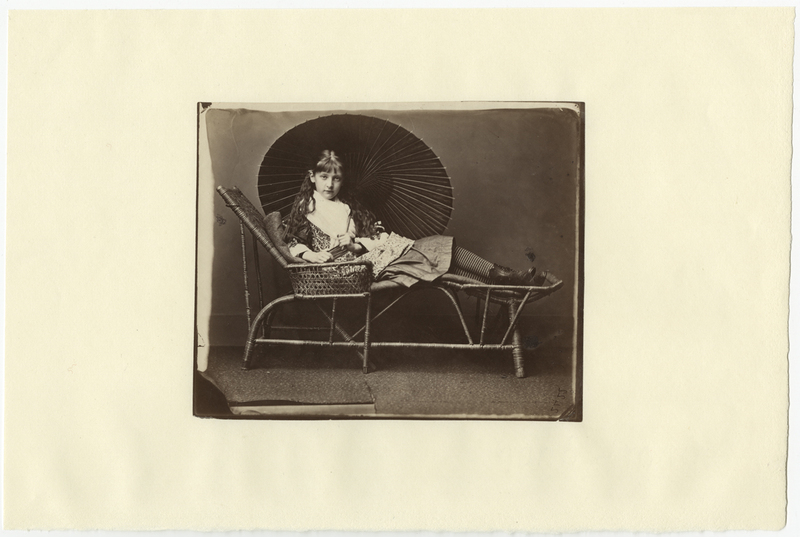 “Xie Kitchin partly in the “Penelope Boothby” dress, on a garden chair, with Japanese sunshade.” 1875–1876. Rev. Charles L. Dodgson. “Xie Kitchin as Penelope Boothby”. 1875–1876. Flukinger published and lectured extensively in the fields of regional, cultural, and contemporary photography and the history of art and photography, and produced or participated in nearly 80 exhibitions. Some of his publications focused on the Ransom Center's Gernsheim collection and other twentieth-century artists and photographers Arnold Newman, Fritz Henle, and David Douglas Duncan. Very interesting! My opinion is that this was one of Dodgson’s favourite ruses- ie photographing ‘in the style of’. I found the painting that he based a photograph of Tennyson’s niece Agnes Weld in the Illustrated London News a few months before he took her picture. I also think that John Tenniel enjoyed the same game (inspired or abetted by Dodgson) as two cariacatures in Through the Looking Glass as one example- were based on Millais paintings- ‘Sir Isumbrus at the Ford’, and ‘My First Sermon’.